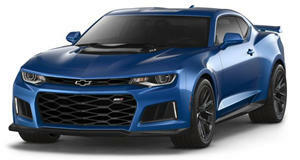 Chevrolet will take on the likes of Ford, McLaren and Porsche on the track with its ZL1-based Camaro GT4.R. Team Chevrolet has unveiled its new GT4 race-spec Camaro to tear up the track with, and we can only hope it looks as menacing as this render suggests. Chevrolet will be entering its souped up Camaro to compete with the likes of Ford, McLaren, Mercedes-AMG and Porsche in the worldwide GT4 racing series. The Camaro GT4.R will sport a tuned version of the 6.2-liter V8 in the ZL1 it’s based on, which produces a tire-smoking 650 horsepower. Mechanical modifications include a race-ready six-speed Xtrac sequential transmission, rear limited-slip differential and adjustable traction control and Ohlins coilovers. As you’d expect, the GT4.R is more aerodynamically-efficient than its road car counterpart, and has been fitted with a new front splitter and diveplanes, as well as a rear wing for added downforce. Sadly, we’ve yet to see the GT4.R in the flesh, but Team Chevy says we will see it in action when it starts racing at some point this year in the IMSA’s Continental Tire SportsCar Challenge, the Pirelli World Challenge and numerous other GT4 racing series. The development of the Camaro GT4.R was aided from the experience gained from Chevrolet’s continued success in racing. Between 2010 and 2016, the Camaro GS and Camaro Z/28.R won 55 races, two manufacturer’s championships and five driving titles in major North American competitions.